I have cookie moods. 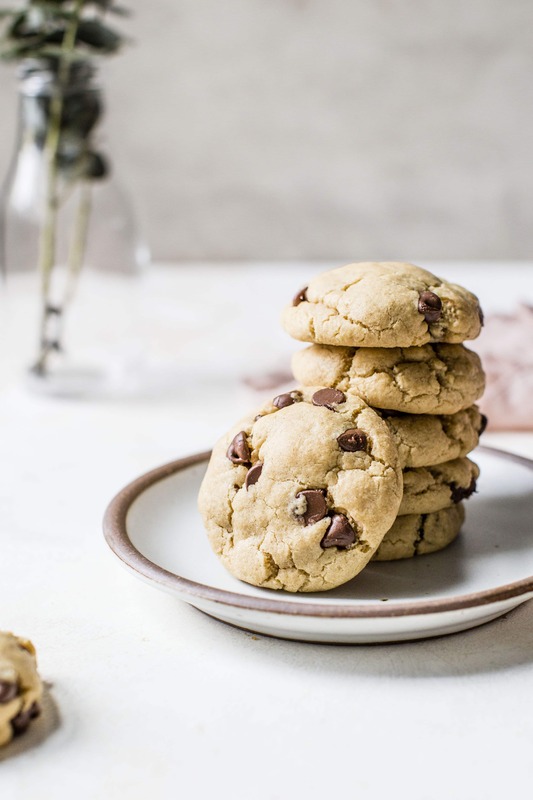 Puffy peanut butter cookies with chocolate chips is a mood. 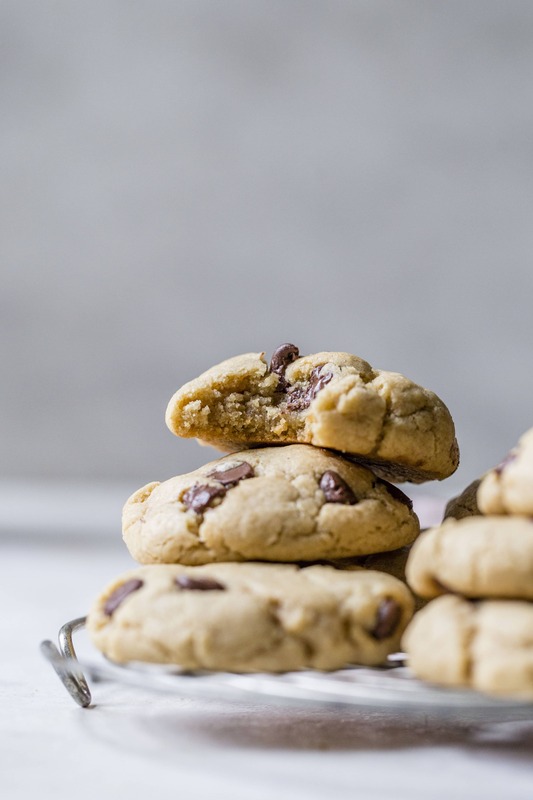 Occasionally, I crave a paper thin cookie – the only kind my dad really likes – when I’m aching for dessert with a raging sweet tooth that just won’t quit. Other days, when I’m reaching for comfort and sometimes feel like eating my emotions, I look for the perfectly thick, chewy cookie, still gooey from the oven, plucked from it’s baking sheet in pieces because I lack patience. And on a rare occurrence, I want to find my cookie inside of things: ice cream, cinnamon rolls, brownies, and bars… to which I will inevitably pick out each piece of cookie so precisely that it appears they were surgically removed by a world class surgeon. A dessert surgeon, that is. This temperamental relationship I share with cookies proves just what a lunatic I am when it comes to food. I can find a time, a place, a day, or an event for any food in wild variation. In fact… my heart sort of bursts when I come across something new and delicious (uh… skillet bacon jam anyone? don’t worry, I bought two jars… just incase.) or rediscover something I once loved and typically burned myself out on. The excitement consumes me and makes me feel alive, vibrant and eager to try new things. Except for broccoli. Broccoli makes me feel dirty, used and generally unkept. Like I need a shower and a $90 exfoliator. After scrubbing the kitchen floor last week on my hands and knees, pretending to clean the bathrooms but really just touching up the spots that everyone see, being extensively domestic and cooking four dinners in a row, I was craving three things. I doubted I was lucky enough to receive a free, live-in maid or a lobotomy, but I knew I could make cookies happen. Cookies are magic. And I wanted the chewy cookies. The fat ones. The comfort ones. The ones that practically beg your to steal them from their cooling rack on the counter. The cookies whose crumbs and broken pieces are happily calorie free and always find a way to jump into your mouth. Sneaky sneaky. So… I made cookies. Not just any cookies. Peanut butter + chocolate cookies. Puffy peanut butter cookies with chocolate chips. You know… only the best combination to ever grace this planet. It’s evident that chocolate and peanut butter were meant to be together when it’s a marriage that you discovered yourself – not from the local cupcake bakery or a store-bought treat, not inherited from your mom or your grandma – found in the comfort of your own kitchen by means of a spoon, an economy-sized jar of Jif and a half used bag of 6-month old chocolate chips. Sponsored by your first broken heart and aversion to any nourishment other than what could be found in the Cheez-It box. Many words came to mind with my first bite: warm, gooey, melt-in-your-mouth delicious, ecstasy… but before I recount a trashy romance novel for you, I gotta tell you this: they were puffy. Fat, fluffy, puffy, chewy cookies. That is what’s UP. Delicious, decadent and stuffed with peanut butter. You totally deserve this. 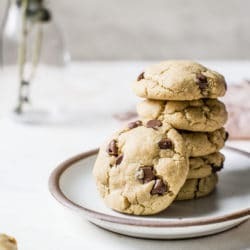 These puffy peanut butter cookies with chocolate chips are my most favorite peanut butter chocolate chip cookie ever! They are soft but also a little chewy and the combination is just to die for! Comes together super easily too. Preheat oven to 325 degrees F. Add butter and peanut butter to a microwave safe bowl, and heat in 30 second increments until melted. Let cool completely. Shape the dough into a ball the size of a golfball. Place on a baking sheet two inches apart and bake for 10-12 minutes or until the edges are slightly brown. The centers should be soft and puffy. Do not over bake. Let cool completely then dig in! P.S. I won’t tell if you want to sprinkle a little coarse sea salt on top. I hear it’s the thing to do. Is there a way to do this without the peanut butter? I’m allergic to all nuts but would like to do a plain puffy chocolate chip version. If i just drop the peanut butter do I have to substitute that ingredient for something else. Maybe up the amount of flour? Looks great. For puffy chocolate chip cookies I use 2 1/4 c flour, 1 tsp baking soda, 1 tsp salt, set aside. 1 c brown sugar, 3/4 c butter, 3 eggs, 1 tsp vanilla, beat be. Sugar and butter till mixed well. Add eggs 1 at a time mixing well between add vanilla. Add 2 1/2 cups of chips mix. 375 degrees for 8 to 11 min. Worls great and not my recipe. I found it online. These look fantastic – thick chewy and a bit gooey. saya sangat berterima kasih dengan resep yang begitu menarik enak kelihatanya nanti kalo sudah saya membuatnya baru saya akan beri kometarnya karena untuk rasa mungkin agak berbeda dengan lidah orang asia umumnya.terima kasih. I have been meaning to comment here for months. 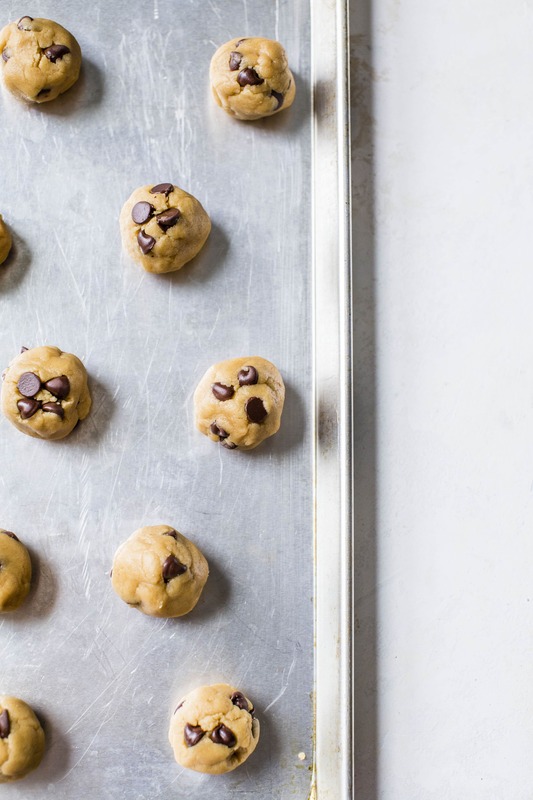 I have made these cookies literally dozens of times, they are a staple in my house. I have the recipe memorized. These are by far the best puffy peanut butter cookies I have been able to find anywhere, so I want people reading to know just how awesome and perfect they are. I have made them under all sorts of conditions–some batches have turned out better than others, but at this point I have each element down to a science to guarantee they come out perfect every time. Warm eggs! Put them in a bowl of hot water. Makes a difference. I personally melt the butter separately and add the peanut butter to it later, so the peanut butter will melt but it helps cool the butter down. I have found that it’s really not a big deal if the butter/peanut butter temp is a little warm. I stick it in the freezer while I prep other stuff to help it get cooler. Mixing it with the sugars will also further cool it down, particularly if you put your mixing bowl in the fridge beforehand. It might be altitude or my crappy old oven, but I cook them for closer to 14 minutes. Maybe it’s just personal preference. Thank you for posting this recipe. It’s amazing. Could you substitute the all purpose flour for whole wheat? If so, how much would I put in? I have made these cookies multiple times, and they always turn out delicious! They are so easy to make. I think it is the perfect combination of peanut butter and chocolate. I also cook mine closer to 14 minutes and they are still soft and puffy. Do I need to use salted butter? This is the first recipe I’ve seen in a long time that called for salted butter, so I just want to be sure it wasn’t a typo. This is the 2nd time I have made these and followed the directions thourghly. Both times the inside is not done so this time I left them in a little longer but the bottom gets brown and would b burnt if left in longer. The whole outside and bottom r done but not inside,. What could I b doing wrong?? I use my kitchen aid and everything is blended right. I also get 30 big cookies each time. Also is the brown sugar packed or loose, I’ve tried both. Could someone please email me so I can try one more time ?? Thank u, I will b waiting for any answers. I also read other replays and seems like everyone is not having any problems !! I tried it today and it was so yummy…they all finished in no time..thanks for this yummy recipe.. These look delicious! Can I use margarine instead of butter? Favourite peanut butter cookies by a landslide! 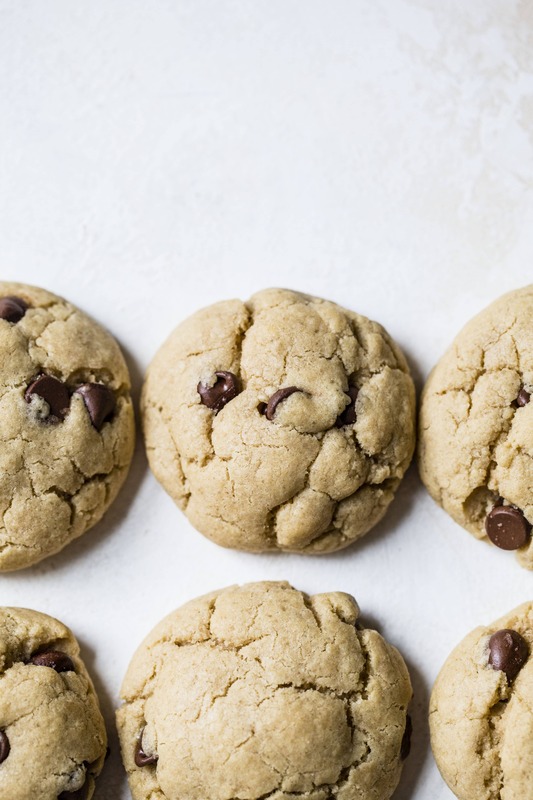 These are our absolute favorite cookies! We make them VERY regularly! So good, thank you for sharing!